An annual flower, occasionally surviving into a second year, blooming almost continuously. If that weren't enough, this plant has edible flowers that add colour to salads, and the petals may be used as an alternative for saffron, and are the traditional source for the colour in Cheddar cheese. Height and spread is 12-18 inches. 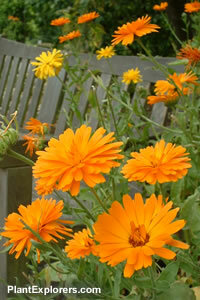 The genus Calendula is now in the family Compositae. For maximum freshness, please keep seed refrigerated in its original packaging until it is time to plant.Sow seeds in situ in spring, cover lightly with soil. The only precaution is to keep the birds away long enough for the seeds to germinate and grow. Grow in well-drained, moderately-fertile soil in full sun.